Having won the German Grand Prix the night before, could Dorian do it again? Would defending English Grand Prix champion Charles Clairmonte be able to retain his title, and topple the mighty Dorian off his throne? THE PLACE: NOTTINGHAM, UK. THE DATE: SUNDAY SEPTEMBER 18, 1994. A capacity crowd of 2,500 screaming and cheering fans made the Nottingham Royal Concert Hall a seething mass of muscular expectation. The lighting was superb and the stage was set for the mother of all battles. 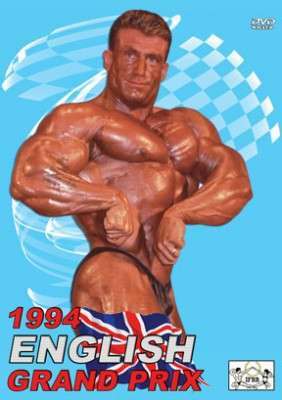 A week before, England’s bodybuilding hero, DORIAN YATES, had just won his 3rd Olympia title. Having won the German Grand Prix the night before, could Dorian do it again? Would defending English Grand Prix champion Charles Clairmonte be able to retain his title, and topple the mighty Dorian off his throne? Everyone knew Charles was going all out to hold his title in this virtual re-run of the Mr. Olympia contest. Would Kevin Levrone spoil the party for Charles or Dorian? FIRST OF ALL LET ME TELL YOU, that taping this Grand Prix was a fantastic experience with the world’s greatest physiques lined up in front of me. Almost as good as taping the Olympia, and the highlight of the year for me!! To see 14 of the Olympia’s best physiques out on stage is the ultimate physique cameraman’s experience. Never to be forgotten! The DVD opens with some pump room footage followed by the lineup and introduction of competitors. Then it’s round 1, the symmetry round – quarter turns in groups of three men. The competitors stand in a relaxed position, and make four quarter turns to the right as called by Wayne DeMilia. This allows the judges to asses each competitor’s symmetry, proportion, skin tone and look for structural defects. Then it’s time for round three – the free posing round. The excitement round! Of special note, this was one of the rare times we caught the following guys on tape as pros – Paul Dillett, Patrick Nicholls, David Dearth, Eddy Ellwood, Porter Cottrell and Samir Bannout. Finally DeMilia calls out the top 6 men and they hit a few more compulsories followed by the exciting posedown for the frenetic audience. “King” Dorian is once again presented with a well-deserved first place trophy and cheque. This is the first ever English Grand Prix appearance of Dorian on DVD. He won this event again 2 years later in 1996. No English GP was held in 1998. An outstanding Matt Canning review of this DVD. Paul Dillett – one of the unsung heroes of the mid-90’s. Dogged by injuries, bad luck and ill health, this charismatic bodybuilder never quite reached his maximum potential. He is an uncrowned Grand Prix winner in our book.